Every Friday is Mega Swagbucks Day where your odds of winning BIG Swagbucks is even better than any other day of the week. 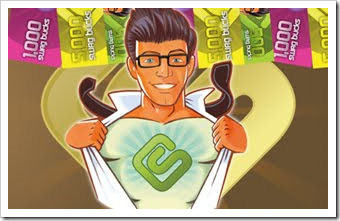 You can win 10, 20, 50 or more than 100 Swagbucks just for searching on any day of the week, but on Mega Swagbucks Day you can possibly win up to 1,000 or even 2,000 Swagbucks just for doing a simple search. You can redeem your Swagbucks for all sorts of prizes, but my favorite thing to do is trade 450 Swagbucks for a $5 Amazon gift card, then I save up the gift cards to buy birthday or Christmas gifts! In fact, I’ve been redeeming my Swagbucks left and right here lately and have already received a bunch of lovely boxes from Amazon 😉 So go ahead and sign up at Swagbucks if you haven’t already and get to searching! Then leave a comment and let us know how much you’ve won. I love Swagbucks and Amazon. Using my swagbucks for Amazon Gift Cards makes shopping so much more fun!